North Wagga, as the name suggests, is a suburb of Wagga Wagga, NSW, situated on the northern side of the Murrumbidgee River. Located in the centre of the township is McPherson Oval, home of North Wagga Saints. McPherson Oval has a highly regarded playing surface, and is considered one of the best in the area. Not only is it home to The Saints, but it has also played host to the Riverina Lions (AFL Canberra Women’s League), GWS Giants Reserves (NEAFL), and local cricket clubs. 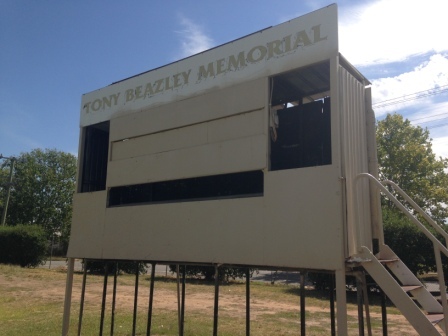 The elevated tin-shed scoreboard is no longer in use and is now known as The Tony Beazley Memorial. 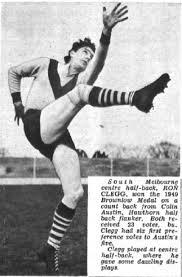 Beazley won a Baz Medal in 1965 as the Farrer Football League Best and Fairest. 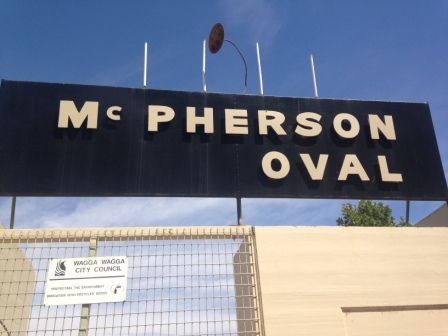 The oval itself is named in recognition of Bill McPherson, who served as club president from 1966-1973 and remains North Wagga’s longest serving president. 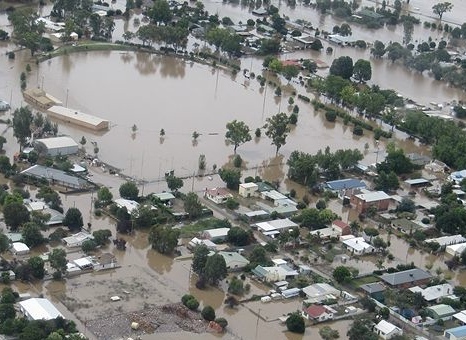 The geographical location of North Wagga has posed a problem for the club, as it is built on a flood plain. This was most recently evident in 2012, when the Murrumbidgee suffered a once in a generation flood. On the eve of the season North Wagga, including the footy ground and clubrooms, was destroyed by floodwater. The resilience of the football club shone through, as the ground and rooms were repaired in time for the 2013 season. The club also showed resilience in 2007, when the club went into recess for a season, due to a lack of players. Passionate supporters of the club managed to get the club back up and running the following year, moving from the Farrer League to the stronger Riverina League. It’s hard to find information regarding how long McPherson Oval has been in use, but Australian football has a very long history in North Wagga. Footy has been played in North Wagga since the late 1880s, originally in an area that is now used as a pony club. The first North Wagga football team was known as The Stars, becoming The Saints in 1957 due to a merger. The story goes that a number of club stalwarts gathered to talk about the new club. While perusing a book of VFL players they came across an image of Bill Mohr in his St. Kilda uniform. Mohr was a native of Wagga, and played junior footy in North Wagga. The gentlemen were so struck by the image, the decision was made to adopt The Saints as their emblem. Bill Mohr is not the only VFL/AFL legend associated with the club. In 1955 the club pulled off a massive coup, convincing 1949 Brownlow Medallist and South Melbourne captain, Ron Clegg, to join North Wagga. Amazingly, they were able to pay Clegg a wage that South were unable to match. He completed one season as captain-coach of the Saints, but returned to South Melbourne the following year, and stayed for another four seasons. Of course, the most famous name associated with North Wagga is that of the man regarded by some as the greatest to ever play the game. Wayne Carey. Carey played all his junior football with North Wagga, before relocating to Adelaide at the age of 15. Even at a young age it was obvious the talent with which Carey was blessed and the club would regularly raise funds to enable the young player to make interstate trips while representing NSW. Even a cursory glance at the trophy cabinet of the Clubrooms at North Wagga, today, reveal a virtual shrine to Wayne Carey. 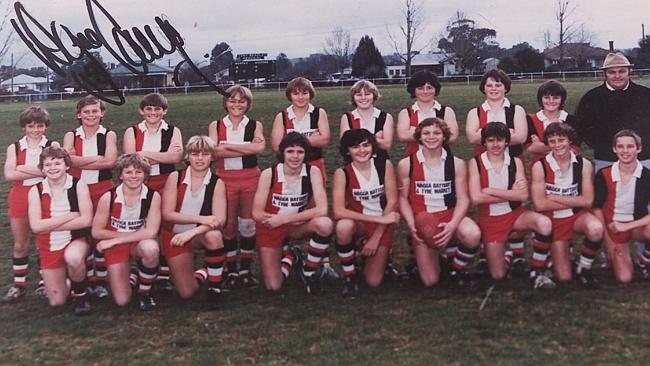 Wayne Carey: second from left, back row. Note: a scoreboard in the background! Image sourced from Herald Sun. 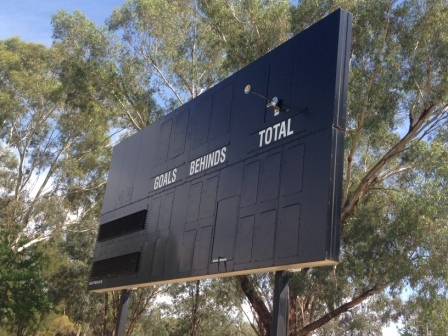 Will the North Wagga electronic scoreboard be named after anyone? Photo by Josh Pinn. Josh Pinn is a footy blogger and podcaster at The Footy Gospel. He also may be, once the ink on the contract dries, Scoreboard Pressure’s Riverina correspondent.